David Powers King: The Legend of Zelda: Twilight Princess - A Pure Fantasy Adventure That "Morphed" Me Into An Instant Fan! 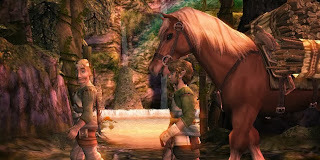 The Legend of Zelda: Twilight Princess - A Pure Fantasy Adventure That "Morphed" Me Into An Instant Fan! I'm a little behind when it comes to the kingdom of Hyrule and the many legends that make up the Zelda franchise. Growing up in the 80's/90's without a console pretty much left me out of the 8-bit experience. I had my dad's PC, however, and I was able to play educational games and star fighter simulators with graphics that spoiled me. Then there's college, and marriage, and kids (don't forget writing), which made it unlikely to really get into gaming as a whole. And then, when the Wii U was introduced, my awesome bro-in-law was cool enough to offer his Wii and also borrow some titles for it. How could I say no to that? Anyway, you know the back story. Now allow me to catch up on the awesome that I've been missing out on. 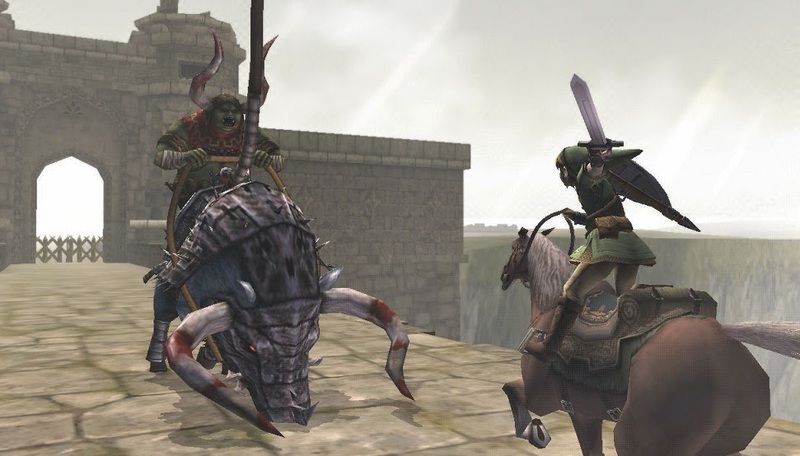 Having never played a Zelda game before, I had no idea what to expect from Twilight Princess, first released in 2006. I was aware that it received a lot of attention and tons of Game of the Year awards, which I thought was odd. Why? I couldn't understand how a game about an elf saving a princess could top everything else. Well, a few minutes of game play later, I was hooked, and it kept getting better! It all starts with a young boy named Link who lives in a tree, seemingly by his lonesome. He is a dependable lad, admonished by his elders and loved by all the kids. 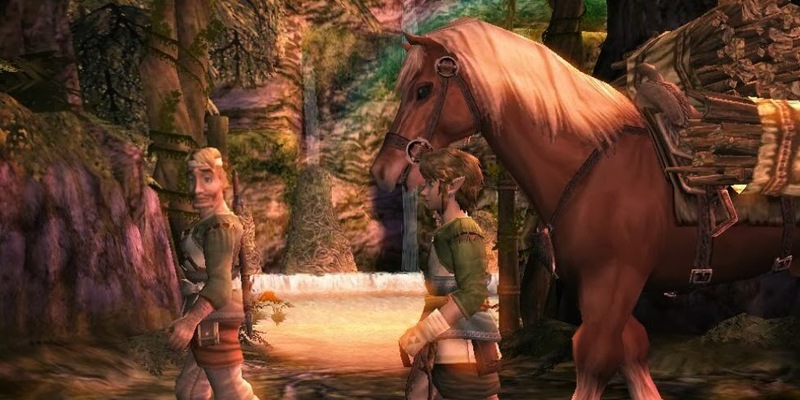 There's even room for a potential love interest who keeps sneaking off with Link's horse. Then, with the coming night, something changes in the horizon, causing the worlds of light and dark to collide into a twilight world! Oh yeah ... >this guy< is in unabashed fantasy heaven! So this girl is taken by shadow creators (to which I thought, wait a sec, aren't these games about saving Zelda?) and Link wakes up in a cell ... as a wolf. This detail alone opens the game up to a whole other interest group! And the odd situation is made odder when a precocious imp frees Link in exchange for his help to return her twilit world where it belongs. I could never tell if I could trust this character or not, which added suspense as the game progressed. So ... Link's running around the land, morphing between a human and a wolf, with an imp on his back who's bossy and tells him what to do. Since Link doesn't say much (non-verbal cues a-plenty), it actually makes the dynamic work. It allowed me to think for Link and made me reflect on what my responses would be. This adventure game did an excellent job of planting me into the shoes (and the long, pointy hat) of this evergreen (and at times fluffy) hero. Demon by demon and ally by ally, Hyrule is beginning to seem normal again. However, Zelda is nowhere to be found. 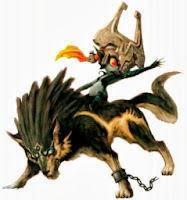 And Midna (the imp) isn't a fan of the princess, for some reason. And that's when the game turned to a plot twist, unexpected and totally appreciated. The evil forces have trapped Zelda in her castle, and when our heroes come to her rescue, knowing that her leaving will bring harm to her people, she stays. That's what I call a leader, and I just couldn't help being captivated by the intelligent manner in which Zelda presents herself. Brains. Beauty. Magic! 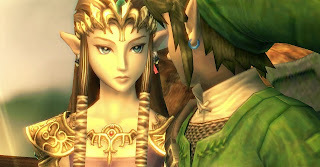 Link should consider himself lucky, but then, whatever happened to Link's girlfriend? More importantly, why haven't I played these games sooner? As the adventure went on, the deeper it became. 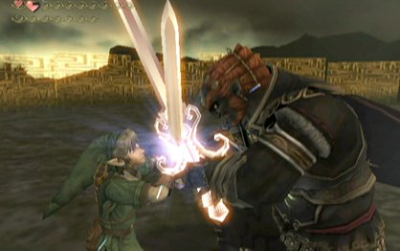 So deep in fact that I was losing track of what Link was supposed to be doing: fun side quests, playing alternate versions of the same world, and jousting giant pig-men on bridges ... and that's the tip of the berg! Don't get me started on the innovative gadgets and dangerous dungeons. And did I mention the obsessively compulsive (if not addictive) need to gather items! But what I found most entertaining of all way the antagonist. 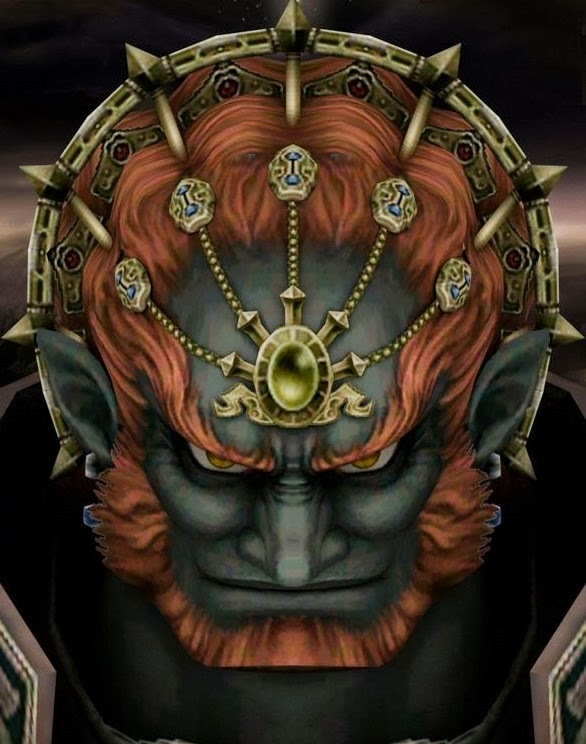 I'm not a fan of villains who exist simply to exist, and this Ganondorf guy fit that mold well, but something about his presence ... one look at me and all my bias convictions on storytelling was thrown out the window. Few bad guys are able to express this level of shear badassery without having to say a word. Even the thought of having to face this guy made me sweat! In one swoop, Ganon entered my top 10 favorite baddies of all time, which is hard to do these days. Two things struck me as being unique about this game. First, it's dark. There's scary creatures and massive bosses Link has to face, and stepping into the twilight world for a bit is loaded with enough nightmare fuel to last a lifetime. Secondly, the game is remarkably clean and kid-friendly, even at the final battle! Where'd all my pieces of heart go?! While the game was longer than I anticipated and a few repeat visits were in order to complete various tasks, I fully understand the hype the preceded my experience, for which this game certainly is. It looks great, it plays great, it encourages reading and makes the player an active participate in the adventure. It even has the capacity to shed a few tears (or make your eyes watery, in my case ... I blame the excellent music and the "sense of loss" ending" ... ahem ...). Now I have some catching up to do, and if Nintendo continues this franchise with this level of pure fantasy escapism, I may just buy the consoles for these games alone, to which Twilight Princess is a masterpiece! What's your take on Zelda games? Which titles have you played? What's your favorite? Got a copy of Skyward Sword I can borrow? I'm David, and Ooccocos may look funny, but they can teleport! I played quite a few of them when I was younger, but haven't played any since. I'm actually kind of glad to hear I'm not the only one who didn't grow up in the 80-90's without a console. My parents refused... Anyhow, I don't game much, but this certainly looks fun! I didn't even have a TV when I was a kid, so these games were out of the question for me. I really enjoyed your post reading about what I missed out on. I've never played any of these games. I remember offering to buy a Zelda game for my boys at some point but they weren't interested. Maybe I can get them to read your blog and change their minds. Hmm...can't say that I've ever played Zelda. I've never played any of the Zelda games. I played all the Atari games, then skipped a few years, played some Sega Genesis games, skipped a few more years, and then lived with Roller Coaster Tycoon until I was sick of playing it. I played the very earliest 2 Zeldas. Fun games. I no longer play games because of hand issues, but I have fond memories of Zelda and I do play Elder Scrolls now and then. I need to get Skyrim at some point. 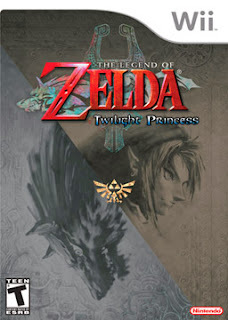 I think Ocarina of time was the best but then I never played Twilight princess much. I've never been able to play those type games myself, would you believe I can't get the stupid characters to even move forward? But, I love watching my kids play them. Zelda was an awesome game, and I still remember the theme music. I've never played this game, but my kids were obsessed with it. And I know all the music, even all the words to "Link has come to Town." Can you believe I have NEVER played Zelda?! Crazy, right? I think my brother still has it somewhere for some ancient console, like original nintendo. I'll have to see if I can get my hands on it. I played a bit of Zelda at someone's house when I was a kid, but don't remember much. Good to see it has gone from strength to strength!